The 2019 Hyundai Veloster N gave the sport compact scene something new to be stoked about at last year’s Detroit Auto Show. This year, Hyundai is following up with a mildly sporty N Line treatment for more of its models starting with the Elantra GT. here’s a breakdown of what this trim will look like. If the Veloster N is between the Honda Civic Si and Type R in terms of extremeness, it sounds like the N Line is at or just below the Si. Another equivalency enthusiasts might appreciate is Audi’s S Line or BMW M Sport. 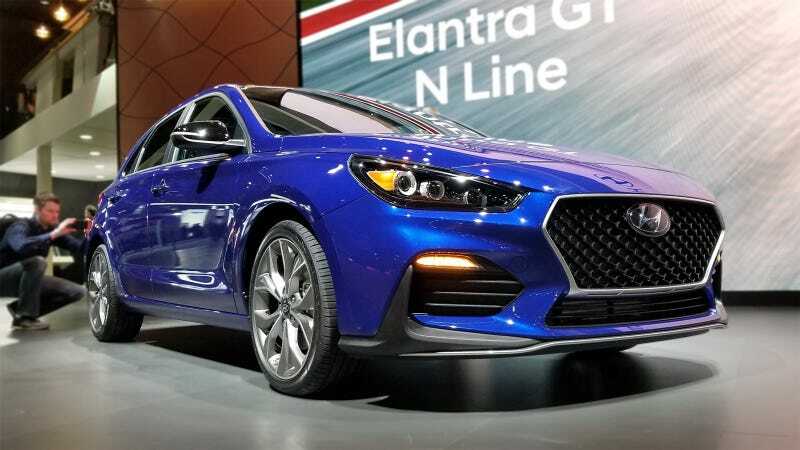 The 2019 Elantra GT N Line is basically replacing the Elantra GT Sport, and will have the same 1.6-liter turbocharged engine with 201 horsepower and 195 lb-ft torque. So yeah it’s not exactly a track day monster. But it also only lists at $23,400 with a six-speed manual, or $24,400 with a seven-speed dual clutch automatic. A base Elantra lists at $20,450, for your reference. Hyundai plans to spread the N Line across a lot more of its lineup, so if you want your efficient daily driver with a little ever-so-mild spice, this could be an option.